Uh, so touring with Voivod seems like a pretty awesome idea. Cheers to Portland, Oregon, trio Eight Bells on landing a gig of gigs in supporting the godfathers of prog-thrash Voivod on their upcoming East Coast and Midwestern run. Eight Bells‘ second LP behind 2013’s impressive The Captain’s Daughter, dubbed Landless, will be released on Feb. 12 via Battleground Records, and in spreading the word even further, the trio has added a long weekender beforehand that caps in Phoenix, Arizona, and will presumably be followed by just as many days of driving on a diagonal across the country — unless they’re flying, which seems like it would be much easier — before picking up Feb. 4 in Massachusetts, to be joined the next night by Vektor and the night after by Voivod as the three-week stint kicks off. With sophomore album Landless coming February 12th on Battleground Records, Eight Bells will embark on a full US tour that includes three weeks supporting avant-metal godfathers Voivod and thrashers Vektor. Kicking off the tour in its hometown of Portland, Oregon, Eight Bells heads south then makes a beeline for the East Coast to join forces with the Voivod/Vektor caravan. Feb 19 – Sanford, FL @ West End Trading Co. 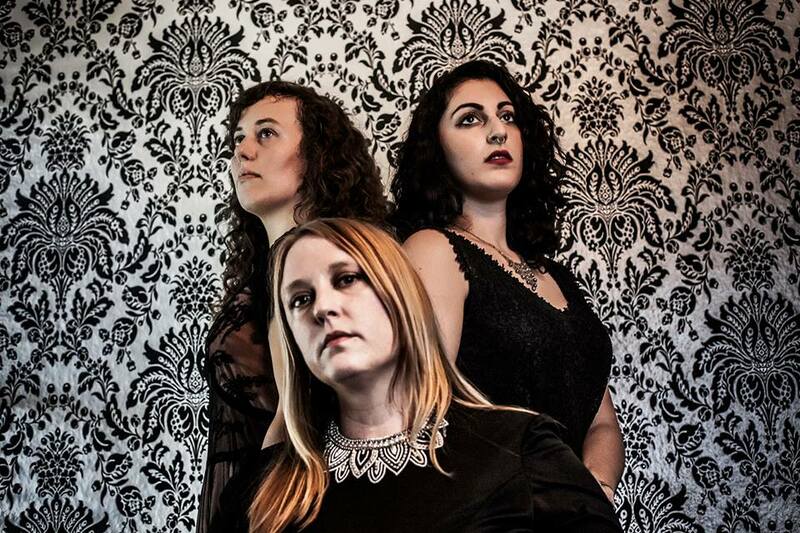 Eight Bells is the trio consisting of guitarist/vocalist Melynda Jackson, formerly of SubArachnoid Space, bassist/vocalist Haley Westeiner, and new drummer Rae Amitay, also of Immortal Bird and Thrawsunblat. Sophomore album Landless, out February 12th on Battleground Records, was recorded and mixed by Billy Anderson (Neurosis, Leviathan) and mastered by Justin Weis (Pallbearer, Agalloch). Over five sprawling tracks, Eight Bells combines the majesty of ’70s Pink Floyd – ethereal vocals, soaring guitars – with 19th-century ghostliness and modern-day black-doom flourishes, to create a sound that transcends time entirely. This entry was posted	on Tuesday, December 29th, 2015 at 3:00 pm	and is filed under Whathaveyou. You can follow any responses to this entry through the RSS 2.0 feed. You can leave a response, or trackback from your own site. There goes another 0.208 seconds.